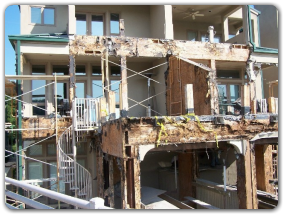 Stucco itself, rarely is a problem.The water intrusion issues occur “where the sidewalk ends”, or all the various terminations and penetrations required during the process of cladding a building.That continuous square footage of stucco in the middle of a wall somewhere with no penetrations is rarely a problem.Tests have shown a properly mixed and applied product to be water resistant in extreme conditions. The most common problematic areas can be summarized as follows. While all are termination issues, some are aggravated by absence or misapplication of other components. The problems do not always evidence themselves, and those that do, are not necessarily obvious. Some of the signs are obvious to anyone, most are very subtle and noticeable to only a trained inspector. At Mark Gault Company, we can provide you with the full scope of services, including casual "walk-arounds", certified documented inspections, complete repair, and assistance in repair cost recovery. If you are considering selling your home, it is important to inspect your home prior to placing it on the market. The independent inspectors who will visit your home after the contract is executed are very much aware of the pervasive problem, and that’s a really bad time to find out about it. “Stickin’ your head in the sand” will NOT make the problem go away! Call Mark Gault Company and schedule an appointment today. We'll come over, walk around the house with you, talk a little, and see where it goes from there.